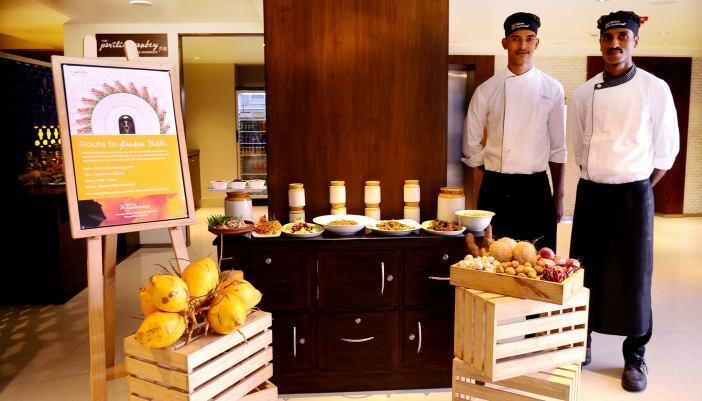 Trivandrum: Hilton Garden Inn, Trivandrum is hosting a ten day Konkan food festival called ‘Route to Konkan Taste’. The dinner only buffet fest based on Konkani cuisine at their Garden Grille Restaurant would feature some of the best delicacies from the Konkan coastal belt. The dishes will include non-veg such as Clams with coconut mildly spiced, Tisrya chi sukhe, Mangalorean style curry, Malvani style fish curry in green masala, Crab with butter, pepper and garlic; Chicken cafreal and Beef vindaloo. etc. Vegetarian options will be Dalimb batate, masala edu vada, kelphulachi vada, lentil dumplings, etc. The Konkan cuisine is strong in spice, red chilli powder, corianders, and prepared with coconut oil. It also uses coconut liberally in various forms such as grated, dry grated, fried, coconut paste and coconut milk. There will be live counters also for starters and dessert. The dinner only buffet food fest concludes on February 26, 2017 and is priced at Rs.1,299/- + Taxes.